Do you want to stay healthy, fit, and slim? If you do, then do what many nutrition and fitness experts say. Include more whole grains in your diet and enjoy many health benefits. Whole grains have all three parts of grain kernels intact. The bran – the firm outer shell of the grain. Bran is high in fiber, antioxidants, and minerals. The endosperm – the mid-section of the grain which is principally composed of carbohydrates. The germ – the inner-most layer that contains protein, minerals, vitamins, healthy fats, and plant compounds. Whole grains can come in crushed, rolled or cracked forms. You can call them whole grains, provided they have all three parts of the grain kernels in their original proportion. Brown rice, whole cornmeal, oatmeal, cracked wheat or bulgur, and whole wheat flour are some examples of whole grains. The milling process results to a finer texture and extends the shelf life of grains. However, it also takes out the bran and germ and most of the dietary fiber, vitamins and minerals they contain. It leaves only the endosperm – the carbohydrate-dense part of the grain kernel. Some vitamins and minerals are added back. However, refined grains, even the “enriched” variety, are not as wholesome or healthy as whole grains. White rice, white bread, white flour, and de-germed cornmeal are some examples of refined grains. They also supply your body with fiber, specifically from the bran. The precise quantity of the nutrients you get will depend on the type of grain you eat. Heart disease is now regarded one of the leading causes of death across the world. Studies suggest that you can lower the threat of heart problems by 22% by simply adding whole grains (at least three 1-ounce servings) to your daily diet. Bran and whole grain cereals and bread in particular have been found to lower the risk of heart-related health issues. You also bring down your risk of stroke when you include whole grains in your daily nutritional plan. The fiber, antioxidants, and Vitamin K in whole grains are regarded as essential in reducing the risk of stroke. Many nutritionists believe that the Mediterranean diet and the Dash diet both help reduce the risk of stroke. Both nutritional plans include generous helpings of whole grains. Nutritionists recommend a high-fiber diet for weight control. Fiber is filling. It eases your hunger so you do not overeat. Whole grains contain a lot of healthy fiber, which helps make you feel full faster. Obese people are usually advised to include whole grains and other fiber-dense food in their diet so they can lose weight. Reduced belly fat and a lower body mass index are attributed to including three servings of whole grains to the daily diet. Research bears out that excess weight and fat are strong risk factors for Type-2 diabetes. Eating whole grains helps you control your weight and prevent obesity. By simply replacing the refined grains in your diet with whole grains and including a minimum of two servings of the healthier grains, you can prevent Type-2 diabetes. Whole grains, primarily because of the magnesium they contain, also bring down fasting blood sugar levels and enhance insulin activity, thus further preventing type-2 diabetes. Whole grains contain fiber which aids in digestion. When you include sufficient fiber in your diet, you have regular, quick and effortless bowel movement. You are seldom constipated. Fiber also acts as prebiotics. It encourages the growth of good bacteria in the digestive tract. These healthy bacteria can help promote digestive health. Inflammation is an essential immune response of the body. When you are injured or infected, you will notice localized symptoms of redness, inflammation, and pain. The inflammation is short-term; it is part of the body’s healing process. When the inflammation becomes persistent, unresolved, and chronic, however, it can lead to fatigue, injury of the blood vessels, joint pain, increased discomfort and chronic diseases. It can result to extensive harm to tissues, and even to cancer, heart disease, and obesity. The risk of inflammation tends to increase with body fat. Whole grains help control inflammation, lose weight and maintain a satisfactory healthy weight level. They also have bioactive compounds and essential nutrients. Whole grains contain prebiotics that feed the good live bacteria, thereby keeping your gastrointestinal tract healthy. Prebiotics also strengthen your immune system. Whole grains also contain antioxidants that can prevent free radicals from causing cell damage. They also contain saponins, phenolic acids, and phytic acids, all of which can prevent and/or retard the development of cancer cells. How do you incorporate more whole grains in your daily consumption? 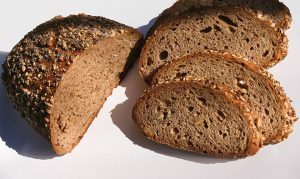 Some people are more familiar with refined grains than with whole grains. However, it is easy to retrain your taste buds and enjoy the fuller, more wholesome, and nuttier taste of whole grains. You have a wide variety of choices for whole grains including oatmeal, quinoa, whole rye, millet, popcorn, wild rice, wheat berry, buckwheat, brown rice, bulgur, barley, and sorghum. Breakfast cereals, pasta, bread, and other products made from these grains are also regarded as whole grain food. Choose crackers, bread, waffles, muffins, and bagels made from whole grain. Choose brown rice or wild rice. When buying pasta, make sure that it is made from whole grain. Enjoy whole-grain salads, pilafs, risotto, and other grain recipes which make use of sorghum, brown rice, quinoa, or millet. Add oatmeal to your meatloaf. Add whole grains to your shrimp Creole, hearty soups, and other similar dishes. Use whole-wheat pita bread to make pizza. Enjoy popcorn as a healthy snack. Use whole wheat buns for your burgers. Use whole wheat bread for your sandwiches. Serve meat and vegetables with wild rice. Make tacos out of stone ground corn tortillas. Sprinkle your yogurt with oats for a satisfying crunch. Use whole grain cornmeal to make polenta. Now that you are aware of how you can benefit from eating whole grains, it’s time to make it a part of your daily diet.